Āryabhatta (b. 476 AD – 550) is the first in the line of great mathematician-astronomers from the classical age of Indian mathematics and Indian astronomy. His most famous works are the Aryabhatiya (499) and Arya-Siddhanta. Aryabhata was born in the region lying between Narmada and Godavari, which was known as Ashmaka,and is now identified with Maharashtra, though early Buddhist texts describe Ashmaka as being further south, dakShiNApath or the Deccan, while other texts describe the Ashmakas as having fought Alexander, which would put them further north. Other traditions in India claim that he was from Kerala and that he travelled to the North, or that he was a Maga Brahmin from Gujarat. However, it is fairly certain that at some point, he went to Kusumapura for higher studies, and that he lived here for some time. Bhāskara I (AD 629) identifies Kusumapura as Pataliputra (modern Patna). He lived there in the dying years of the Gupta empire, the time which is known as the golden age of India, when it was already under Hun attack in the Northeast, during the reign of Buddhagupta and some of the smaller kings before Vishnugupta. His first name “Arya” is a term used for respect, such as "Sri", whereas Bhatta is a typical north Indian name -- found today usually among the “Bania” (or trader) community in Bihar. 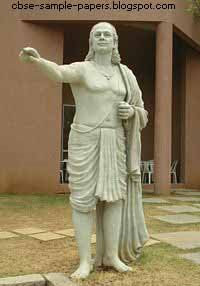 Aryabhata is the author of several treatises on mathematics and astronomy, some of which are lost. His major work, Aryabhatiya, a compendium of mathematics and astronomy, was extensively referred to in the Indian mathematical literature, and has survived to modern times. The Arya-siddhanta, a lost work on astronomical computations, is known through the writings of Aryabhata's contemporary Varahamihira, as well as through later mathematicians and commentators including Brahmagupta and Bhaskara I. This work appears to be based on the older Surya Siddhanta, and uses the midnight-day-reckoning, as opposed to sunrise in Aryabhatiya. This also contained a description of several astronomical instruments, the gnomon (shanku-yantra), a shadow instrument (chhAyA-yantra), possibly angle-measuring devices, semi-circle and circle shaped (dhanur-yantra / chakra-yantra), a cylindrical stick yasti-yantra, an umbrella-shaped device called chhatra-yantra, and water clocks of at least two types, bow-shaped and cylindrical. A third text that may have survived in Arabic translation is the Al ntf or Al-nanf, which claims to be a translation of Aryabhata, but the Sanskrit name of this work is not known. Probably dating from the ninth c., it is mentioned by the Persian scholar and chronicler of India, Abū Rayhān al-Bīrūnī. gitikApAda: (13 verses) large units of time - kalpa, manvantra, yuga, which present a cosmology that differs from earlier texts such as Lagadha's Vedanga Jyotisha(ca. 1st c. BC). Also includes the table of sines (jya), given in a single verse. For the planetary revolutions during a mahayuga, the number of 4.32mn years is given. kAlakriyApAda (25 verses) : different units of time and method of determination of positions of planets for a given day. Calculations concerning the intercalary month (adhikamAsa), kShaya-tithis. Presents a seven-day week, with names for days of week. golapAda (50 verses): Geometric/trigonometric aspects of the celestial sphere, features of the ecliptic, celestial equator, node, shape of the earth, cause of day and night, rising of zodiacal signs on horizon etc. In addition, some versions cite a few colophons added at the end, extolling the virtues of the work, etc. The Aryabhatiya presented a number of innovations in mathematics and astronomy in verse form, which were influential for many centuries. The extreme brevity of the text was elaborated in commentaries by his disciple Bhaskara I (Bhashya, ca. 600) and by Nilakantha Somayaji in his Aryabhatiya Bhasya, (1465). Statue of Aryabhata on the grounds of IUCAA, Pune. The number place-value system, first seen in the 3rd century Bakhshali Manuscript was clearly in place in his work; he certainly did not use the symbol, but the French mathematician Georges Ifrah argues that knowledge of zero was implicit in Aryabhata's place-value system as a place holder for the powers of ten with null coefficients. However, Aryabhata did not use the brahmi numerals; continuing the Sanskritic tradition from Vedic times, he used letters of the alphabet to denote numbers, expressing quantities (such as the table of sines) in a mnemonic form. "Add four to 100, multiply by eight and then add 62,000. By this rule the circumference of a circle of diameter 20,000 can be approached." In other words, π= ~ 62832/20000 = 3.1416, correct to five digits. The commentator Nilakantha Somayaji, (Kerala School, 15th c.) interprets the word āsanna (approaching), appearing just before the last word, as saying that not only that is this an approximation, but that the value is incommensurable (or irrational). If this is correct, it is quite a sophisticated insight, for the irrationality of pi was proved in Europe only in 1761 by Lambert). After Aryabhatiya was translated into Arabic (ca. 820 AD) this approximation was mentioned in Al-Khwarizmi's book on algebra. that translates to: for a triangle, the result of a perpendicular with the half-side is the area. Find the number which gives 5 as the remainder when divided by 8; 4 as the remainder when divided by 9; and 1 as the remainder when divided by 7.
i.e. find N = 8x+5 = 9y+4 = 7z+1. It turns out that the smallest value for N is 85. In general, diophantine equations can be notoriously difficult. Such equations were considered extensively in the ancient Vedic text Sulba Sutras, the more ancient parts of which may date back to 800 BCE. Aryabhata's method of solving such problems, called the kuttaka method. Kuttaka means pulverizing, that is breaking into small pieces, and the method involved a recursive algorithm for writing the original factors in terms of smaller numbers. Today this algorithm, as elaborated by Bhaskara in AD 621, is the standard method for solving first order Diophantine equations, and it is often referred to as the Aryabhata algorithm. The diophantine equations are of interest in cryptology, and the RSA Conference, 2006, focused on the kuttaka method and earlier work in the Sulvasutras. 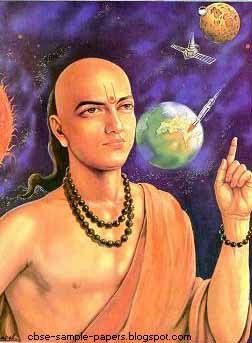 Aryabhata's system of astronomy was called the audAyaka system (days are reckoned from uday, dawn at lanka, equator). Some of his later writings on astronomy, which apparently proposed a second model (ardha-rAtrikA, midnight), are lost, but can be partly reconstructed from the discussion in Brahmagupta's khanDakhAdyaka. In some texts he seems to ascribe the apparent motions of the heavens to the earth's rotation. But the next verse describes the motion of the stars and planets as real movements: “The cause of their rising and setting is due to the fact the circle of the asterisms together with the planets driven by the provector wind, constantly moves westwards at Lanka”. Lanka (Sri Lanka) is here a reference point on the equator, which was taken as the equivalent to the reference meridian for astronomical calculations. Aryabhata described a geocentric model of the solar system, in which the Sun and Moon are each carried by epicycles which in turn revolve around the Earth. In this model, which is also found in the Paitāmahasiddhānta (ca. AD 425), the motions of the planets are each governed by two epicycles, a smaller manda (slow) epicycle and a larger śīghra (fast) epicycle. The order of the planets in terms of distance from earth are taken as: the Moon, Mercury, Venus, the Sun, Mars, Jupiter, Saturn, and the asterisms. The positions and periods of the planets were calculated relative to uniformly moving points, which in the case of Mercury and Venus, move around the Earth at the same speed as the mean Sun and in the case of Mars, Jupiter, and Saturn move around the Earth at specific speeds representing each planet's motion through the zodiac. Most historians of astronomy consider that this two epicycle model reflects elements of pre-Ptolemaic Greek astronomy. Another element in Aryabhata's model, the śīghrocca, the basic planetary period in relation to the Sun, is seen by some historians as a sign of an underlying heliocentric model. He states that the Moon and planets shine by reflected sunlight. Instead of the prevailing cosmogyny where eclipses were caused by pseudo-planetary nodes Rahu and Ketu, he explains eclipses in terms of shadows cast by and falling on earth. Thus the lunar eclipse occurs when the moon enters into the earth-shadow (verse gola.37), and discusses at length the size and extent of this earth-shadow (verses gola.38-48), and then the computation, and the size of the eclipsed part during eclipses. Subsequent Indian astronomers improved on these calculations, but his methods provided the core. This computational paradigm was so accurate that the 18th century scientist Guillaume le Gentil, during a visit to Pondicherry, found the Indian computations of the duration of the lunar eclipse of 1765-08-30 to be short by 41 seconds, whereas his charts (by Tobias Mayer, 1752) were long by 68 seconds. Aryabhata's computation of Earth's circumference as 24,835 miles, which was only 0.2% smaller than the actual value of 24,902 miles. This approximation might have improved on the computation by the Greek mathematician Eratosthenes (c.200 BC), whose exact computation is not known in modern units. Considered in modern English units of time, Aryabhata calculated the sidereal rotation (the rotation of the earth referenced the fixed stars) as 23 hours 56 minutes and 4.1 seconds; the modern value is 23:56:4.091. Similarly, his value for the length of the sidereal year at 365 days 6 hours 12 minutes 30 seconds is an error of 3 minutes 20 seconds over the length of a year. The notion of sidereal time was known in most other astronomical systems of the time, but this computation was likely the most accurate in the period. Āryabhata claims that the Earth turns on its own axis and some elements of his planetary epicyclic models rotate at the same speed as the motion of the planet around the Sun. This has suggested to some interpreters that Āryabhata's calculations were based on an underlying heliocentric model in which the planets orbit the Sun. A detailed rebuttal to this heliocentric interpretation is in a review which describes B. L. van der Waerden's book as "show[ing] a complete misunderstanding of Indian planetary theory [that] is flatly contradicted by every word of Āryabhata's description," although some concede that Āryabhata's system stems from an earlier heliocentric model of which he was unaware. It has even been claimed that he considered the planet's paths to be elliptical, although no primary evidence for this has been cited. Though Aristarchus of Samos (3rd century BC) and sometimes Heraclides of Pontus (4th century BC) are usually credited with knowing the heliocentric theory, the version of Greek astronomy known in ancient India, Paulisa Siddhanta (possibly by a Paul of Alexandria) makes no reference to a Heliocentric theory. Aryabhata's work was of great influence in the Indian astronomical tradition, and influenced several neighbouring cultures through translations. The Arabic translation during the Islamic Golden Age (ca. 820), was particularly influential. Some of his results are cited by Al-Khwarizmi, and he is referred to by the 10th century Arabic scholar Al-Biruni, who states that Āryabhata's followers believed the Earth to rotate on its axis. His definitions of sine, as well as cosine (kojya), versine (ukramajya), and inverse sine (otkram jya), influenced the birth of trigonometry. He was also the first to specify sine and versine (1 - cosx) tables, in 3.75° intervals from 0° to 90°, to an accuracy of 4 decimal places. In fact, the modern names "sine" and "cosine", are a mis-transcription of the words jya and kojya as introduced by Aryabhata. They were transcribed as jiba and kojiba in Arabic. They were then misinterpreted by Gerard of Cremona while translating an Arabic geometry text to Latin; he took jiba to be the Arabic word jaib, which means "fold in a garment", L. sinus (c.1150). Aryabhata's astronomical calculation methods were also very influential. Along with the trigonometric tables, they came to be widely used in the Islamic world, and were used to compute many Arabic astronomical tables (zijes). In particular, the astronomical tables in the work of the Arabic Spain scientist Al-Zarqali (11th c.), were translated into Latin as the Tables of Toledo (12th c.), and remained the most accurate Ephemeris used in Europe for centuries. Calendric calculations worked out by Aryabhata and followers have been in continuous use in India for the practical purposes of fixing the Panchanga, or Hindu calendar, These were also transmitted to the Islamic world, and formed the basis for the Jalali calendar introduced 1073 by a group of astronomers including Omar Khayyam, versions of which (modified in 1925) are the national calendars in use in Iran and Afghanistan today. The Jalali calendar determines its dates based on actual solar transit, as in Aryabhata (and earlier Siddhanta calendars). This type of calendar requires an Ephemeris for calculating dates. Although dates were difficult to compute, seasonal errors were lower in the Jalali calendar than in the Gregorian calendar. India's first satellite Aryabhata, was named after him. The lunar crater Aryabhata is named in his honour. Get all Latest Sample Papers in your inbox ! A study schedule to crack TOEFL, IELTS !